Writing that, the day after individual gizmos working with box select. I guess you’re not following the news. That feature was added because their animators finally asked for it, not because we regular users were asking for it, which you know, we were requesting it since the code quest. Pay attention on what is happening. from my vision, I continue to believe that more generally, blender must become more contextual and more predictor in its various areas of work. I think of the real world, of a painter who wants to have his canvas to work on, with his palette of colors in his left hand and the brush set for the right hand (or vice versa is just an example) and nothing else that disturb his work and that is superfluous to that mode and area of ​​work. starting from this concept, it is clear that the global dimension of the window space of the property panels is at the moment a mixture of containers that contains many buttons and many tools that are often asynchronous with particular working methods and therefore is not at all predictive and contextual and it carries an ancient flaw that is intrinsic from the birth of blender itself … and that I believe that one day the devs and the designers will have to take head-on and resolve once and for all. 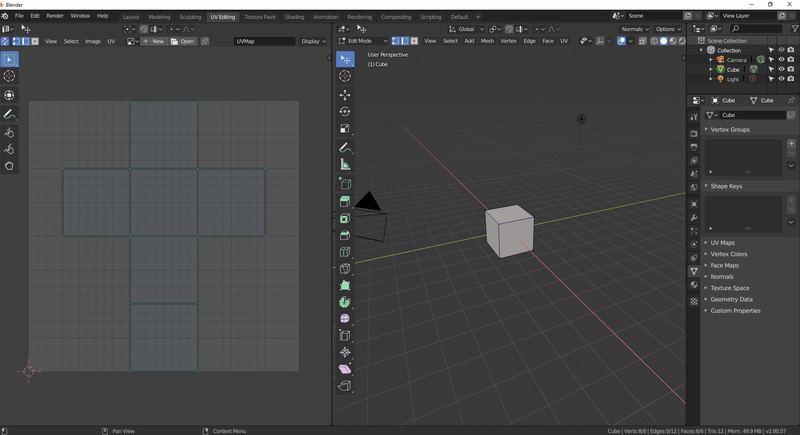 The reasons are obvious, the functionality of blender will continue to increase over time, and the only way to maintain a certain order and simplicity is to make this area a sort of pseudo-intelligent “Jarvis” that will always know according to the work area that the user is adopting, which tools he will need. Another thing that could be useful to cover more possibilities, is to create an Editor Type called “Tool settings” containing only Tool Settings. So some user could create a workflow similar to what Blender 2.8 currently looks, placing that new Editor on top (or anywhere) along the screen without needing it to be a complete 3D Viewport Editor put there just to use the Tool Settings part. ( * ) For now it is not possible to have only visible Tool Settings, when you uncheck option “Show Header”, the two bars are hidden. Regarding that tool settings editor, I think it’s almost exactly what we have now in properties - except well it’s in properties, but that doesn’t make much of a difference does it ? @lsscpp, @Hadriscus. Yes, I mean horizontal version. If you read above, some users were not happy with new changes because elements would not fit well in small 3D Viewport Editor. With what I propose they could have a similar workflow to what Blender currently looks like in master, without having to use a complete 3D Viewport as I show in a screenshot in some post above. To be honest I’m not so fond of horizontal tool settings because most monitors are wider than they are tall, so I believe it is more sensible to keep those vertical, but it would indeed be nice to have a choice. What I would like best, now that tool settings are back in the editors, is to have them on the side, as an additional sidebar. I’ve expressed that wish before but I haven’t made a mockup to illustrate. I think I’m gonna take some time this weekend to make something, it might be worthwhile. I don’t think there is a fundamental difference compared to Ctrl Spacebar before or after move of Topbar to header. Tool settings tab of properties is already updating relatively to active brush. And Ctrl Spacebar can hide it without hiding topbar. That is a mock-up for sculpt mode. But there is nothing proposed, here that does not simply break current mode separation between sculpt mode and object mode. If you switch to object mode, you have access to what is mentioned. Pablo started to mix sculpt mode with vertex paint mode, color was added under its branch. If settings, buttons or popovers continued to be added for remeshing and filters Tool Settings bar will be quickly filled. It is up to Pablo Dobarro to try something for sculpt mode. There is also the idea to use nodes for brushes. Maybe that would generate other thins to add to header. I think that filling the empty space in header by custom icons should be allowed for addons, etc. But IMO, only things that are really new would bring a benefit. Add objects icons in a sculpt mode that would continue to prevent to add objects would not make sense. it’s now committed… now each editor has it’s own topbar but still acts like one for tools settings, probably separation comes later, i don’t think it’s that bad, just you have to scroll a bit more if you have two+ viewports open. Apparently a good side effect of this change, is that nothing will be called TopBar. So maybe this will prevent people coming from other 3D apps expect Tool Settings bar to behave like those other TopBar. Who knows, maybe a bar that fulfills the function of those other TopBar can be implemented later. That mock-up changes tools buttons as tabs. Currently toolbar can be expanded to have 2 columns of tools or to display names of tools. I suppose that being such move will force us to renounce to that. That is a little bit annoying if user wants to add buttons to toolbar by using addons. That is a pity that such aspect of toolbar is currently under-exploited. There is space for several dozens of buttons into it. And many dozens if its 2D VIew focus is modified. When you expand a space-window to “full screen” it automatically becomes a specific and functional top bar for that woking area. Blender should be considered as a set of many applications inserted in window-spaces with the work shared among all of them. … so in this sense it is an operating system totally focused on CGI, so it makes sense that every space-window has its specific top bar when needed.